I was a guest in someone's home. That's what this hostel has to offer. An old Spanish style house, with no elevator, but an atrium feel to it. My room was perfect: double bed, wash stand and desk. The bathrooms, two of them, were feet away from my room and modern and clean. All of the hostel bathrooms I have encountered on my trips have up-to-date features and are positively a pleasure to use. Better than home. The hostel owner didn't speak much English, but she and I seemed to talk and laugh. Was a good stay. Really in the city center. Recommendable. Everything was amazing but not a place to meet young people, more of a family feel. The place worked well, we really just used it to sleep and take showers, and the rest of the time we were out and about. This location is easy to get to all the destinations that you want to see in Sevilla. If we're ever back in the area, we'll definitely stay there again, plus Pacific was great! ¡Olé! Quite good, friend,y and helpful staff. A most pleasant visit. Value for money. 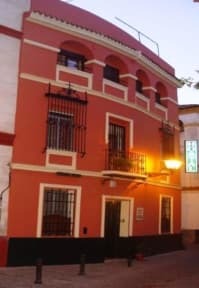 It was a good place to spend a night in Sevilla and it was located close to the centre. 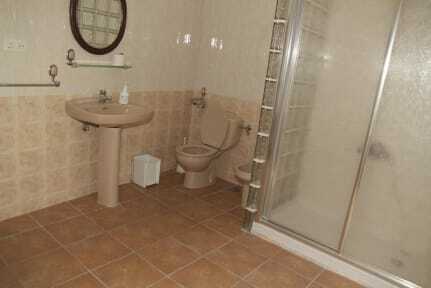 It was a slight surprise to find no en-suite but that may be me, as I booked it in a bit of a hurry. Anyway the WC and shower was right next to our room. All three of us in our party had a good stay. In general my staying there was pleasant. Good location, you can walk to the center for 15 minutes, in the meanwhile you enjoy the neighborhood's beauty. The building is nice, with tiles in the walls, 3-4 flours (no elevator). There is not a special atmosphere. Negatives: Only 1 plug in the room for 2 people. This hostel is in a great location, really close to the Cathedral and has great wifi and security. However, bear in mind this hostel does not have a kitchen or a shared living space and is very low key with limited atmosphere. The bathrooms were relatively clean but the hot water was VERY temperamental (to the point of not working a lot of the time) and there was a lot of noise, including construction work, most of the day and a lot of the night. Overall not bad but a bit underwhelming. Perfect location and nice interior of the main hall of the building. However, I think it’s not so good value for money because it wasn’t perfectly clean, especially the floor, our room was very noisy due to thin walls and the street and some of the staff couldn’t speak English at all. The location right in the Old Town is really easy to get to all the famous sites by foot, as well as close to many great little restaurants. Also the price for our 3 bedroom private room was really cheap too, so it was a good choice if you are on a tight budget. The biggest thing we didn't enjoy about our stay was that our room was soooooooo cold. I guess Seville was having a bit of a cold snap and the hotel doesn't have any heat, so the material of the room/building really kept in the cold.